It's Can O' Clock - time to promote your business brand with a product that's unique from any other promotional freebie in every way. Grab your customers' attention using our smart Clock in a Can and have your own little silent salesman on their desks - gaining brand-name retention whenever they check the time. 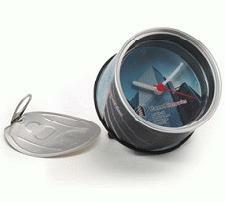 Eye catching, this battery powered promotional Clock in a Can is supplied with batteries and included a fold-out stand-on base. Peel-off the lid and reveal the analogue clock inside. Your Company's customised artwork will look stunning on the circumference of this personalised Clock in a Can, so why not hand out a batch of these fabulous Clock in a Can company freebies and add a chime to your corporate brand-name! For a FREE QUOTE, please fill in the form regarding our Clock in a Can and we'll be able to help you.